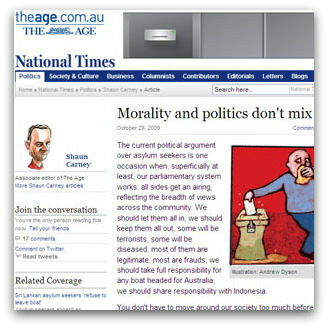 In a reflective article in the Fairfax Press, Shaun Carney argued that it is not helpful to expect that politicians will treat the arrival of asylum seekers as a moral issue. Their decisions almost always involve compromise and conflict between professed values and actions. I would like to argue that, whatever of political practice, we should ask politicians to consider the morality of their policies, and that to divorce politics from morality damages Australia. Carney argues that although the refugee issue has moral aspects, governments can never fully embody moral positions. Politics is about compromise, so that moral rhetoric betrays government action and only alienates its support base. Nor does moral reflection resolve the questions which the government must grapple: the conflict between the needs of Australians and those of refugees, the decision about how many refugees we can take, the encouragement that generous policies may give to people smugglers who will then put more people's lives at risk, and our relative responsibilities to asylum seekers from different nations. Carney canvasses the idea that governments should be expected to treat refugee policy as 'just politics', so removing the moral dimension in the way that business people do when they speak of 'just business'. This would avoid the inevitable disillusion that attends politicians whose actions do not match their words. In this account moral reflection appears to be identified with simply insisting on universal principles. I would argue that moral reflection extends beyond this to negotiating how moral principles apply to the circumstances of each policy and decision. I have argued elsewhere that the universal moral principle at issue in our response to asylum seekers is that we have a responsibility, as persons and nations, to respect the human dignity of those who make a claim on us, and to help them live with dignity insofar as that is reasonably possible for us. Political decisions then need to consider the moral and other dimensions of 'what is reasonably possible'. In making these decisions we need to take into account the wealth and resources of Australia relative to other nations, the relative burden borne by Australia imposed by on-shore asylum seekers, the needs of the Australian population, the relative needs of those who make a claim on us, and so on. In this reflection, the human dignity of those affected by our policy and decisions must remain in the foreground. For that reason, Sri Lankan asylum seekers make a claim on us, just as much as Iraqi and Afghan refugees. The political challenge is to carry through this moral calculus into practicable policy. This is already done in the process of refugee determination, which establishes criteria for judging which asylum seekers are to be accepted as refugees. In the past it was also enshrined in concerted actions by which governments combined to stem refugee flows. They promised resettlement to those found to be refugees, and assisted the nations from which they fled to accept others back safely and without discrimination. The principal moral demand placed upon refugee policy is that it respect the dignity of asylum seekers at each point of their journey. This forbids abusing their dignity as an instrument of policy. Indefinite and mandatory detention, the regime of Temporary Protection Visas, and the conditions of the Pacific Solution all involved abusing the dignity of asylum seekers in order to deter others. The Indonesian solution appears to involve the same abuse. I agree with Carney when he insists that there is more to politics than morality. Politics is also about persuasion, about judging what is timely, about priorities in making resources available. In the case of asylum seekers, governments need to communicate and promote a humane policy. But no government can be expected to act in moral ways against the strong and continuing opposition of its people. To propose and defend a humane perspective is the responsibility of groups and individuals within the community. If we finish with a popular but brutal policy towards asylum seekers, we need to reflect on our own shortcomings as citizens and not simply blame the government. Finally, I believe it would be disastrous if we became content that governments should practise 'politics as usual'. The trust that citizens have in governments is based on the assumption that they will generally act in humane and principled ways. The government will be a model litigant, will not discriminate against its opponents, and will act in accordance with law. If people abandon these ethical expectations it will diminish the trust citizens have in the government, and ultimately in each other. In the case of immigration policy, it also corrupts the sensibility, and ultimately the grasp of reality, of those who preside over immoral policies. We have already seen the consequences for the economy of tolerating 'business as usual'. It would be a pity to prostitute government in the same way. In yielding to those who press themselves upon us, do we not do disservice to those patiently waiting their turn in numerous horrific refugee camps around the world? The recent controversy over a few asylum seekers has been a distraction for the mass of arrivals who come here legally. Kevin Rudd is supposed to be a Christian, but this potential "Good Samaritan" prefers to allow asylum seekers to drown at sea, go back home or to Muslim Indonesia! According to the Australian Bureau of Statistics, Net Overseas Migration contributed 60.6 per cent of Australia’s population growth in 2008, compared to 39.4 per cent contributed by natural increase. With mixed messages being sent to people overseas, it is no wonder that the oppressed and persecuted think that they should be welcomed here! If our population growth wasn't toppling over sustainable levels, we could afford to show some compassion for legitimate refugees. No, our PM only wants students willing to pay for their own education, investors, and those who are carefully selected for their skills and economic value! There is no room for humanitarian entry into Australia. Good call Andrew. Yes, Morality, Compassion, Respect and Courage, all things that seem to be lacking from Politicians today. We, the public, the people of Australia need to speak up and ask our local politicians to behave in this way. It amazes me how Rudd's disgraceful policy stance is being treated with such kid-gloves, especially when compared to the response to Howard's essentially no-different policy. The main difference between the two is that Howard didn't try to shirk responsibility while pretending to take high moral ground. On Q&A last night, it was almost as though the Liberals were the source of the current problem. Maxine McKew was hardly challenged yet she was representing a government that is responsible for the disgrace. It's nauseating to hear all the mainstream parties - Liberal, Labor and Greens - rail against the people smugglers. If the smugglers are the real issue, then we can easily and promptly defeat them by opening our borders. Closed and restricted borders are a recent phenomenon in modern human history (mid to late C19th) and we will all remain stuck in 'ground hog day' until the notion of open borders is applied to human beings as it is to commodities. Barry York is guilty of intellectual fraud when he equates the movement of people with the movement of goods and services. Goods and services do not have a mind or free will. They cannot decide of their own volition to move anywhere. They can only be moved by people. I would remind Barry that we have tens of thousand of homeless people here plus tens of thousands on waiting lists for public and low cost housing. Just how many asylum seekers would you let in Barry? How can people be so surprised about the way our politicians act in this matter? Politicians know that by far the majority of their constituency want to see them carefully managing the countries migration policy - particularly at a time when they hear daily about the massive climate & economic challenges we face and hear the daily call from charities and others for special help for the large number of underprivileged & disadvantaged in our community. To appear to be other than tough on this issue would be fatal for politicians. Robert, what tosh. Asylum seekers have similar stories and immediate needs. We would not take any of the people you whine about in a blue fit. And Vivienne the refugees are from Sri Lanka, not Indonesia. None of them are Indonesians, they are Afghans, Iraqis, Iranians, Palestinians. It is nothing to do with Indonesia. How many to let in? Aa many as want to come, basically. As America did in the late C19th and early C20th. As European countries that were once in almost constant warfare are now doing via the EU. As so many South American countries are also doing via the Mercosur agreement and, indeed, as New Zealand and Australia have been doing for many years. The day will come when open borders are taken for granted and people valued as part of the solution to problems rather than part of the problem. The problems of homelessness and poverty are no more caused by 'over-population' today than they were when the nasty old reactionary Malthus proposed the notion two centuries ago. Such problems are caused by social and economic systems, and that's where we need to start looking - why should a country so vast in natural resources and so under-populated as Australia have such problems? We need to embrace people and the future rather than fear both, as reactionaries such as Rudd, Turnbull and the Greens do. As Andrew notes, no government can be expected to act in moral ways against the strong and continuing opposition of its people. We need to make the argument in favour of the acceptance of refugees based less on their need and more on our gain. For it is a matter of recent history that we are enriched as a nation by our acceptance of them. It is perhaps a sad fact that many appear to place self interest ahead of moral argument based on compassion. I would argue that an acknowledgement of our gain is the stuff of political argument and would hope that our current government has sufficient wisdom to do so. The reception of asylum seekers is to be judged by the human reality of those who seek asylum, not by convenience of those on whom they make a claim. It is morally unjustifiable for Australia to transfer its responsibilities to Indonesia.